Great post, and what a funny video! I found your post to be very interesting. I am a preschool teacher at a local daycare and although like you said the Mozart Effect may just be for markets to manipulate studies and make false accusations and assumptions, I have found that playing classical music sometimes soothes the children. Each child is required to either rest or sleep for a duration of time and we too choose to play classical music. For some reason we have found it to calm down the children after a busy morning. The video of this baby is absolutely adorable and I have found this same expression with my students as well. Good post! I have three sisters and they all have kids. 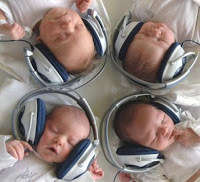 Although classical music may not increase a child's intelligence it does seem to calm them, atleast in the car. They also may have just enjoyed the car ride, but either way they were quiet for a while! Great post and presentation in class! I love the video with the baby in the car. I know that music is good for calming children or getting them to be more active but its hilarious that they have marketed the study to children when it was done on college students.